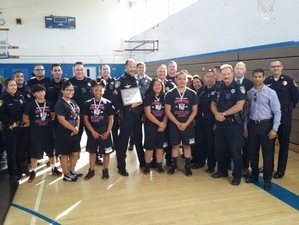 The Wildcats scored 242 points over the Vallejo PAL(19 points) and HMS-PE(17 points) to win their 18th consecutive Vallejo City Championships with our good friends from the Vallejo Fire Department on hand to support. 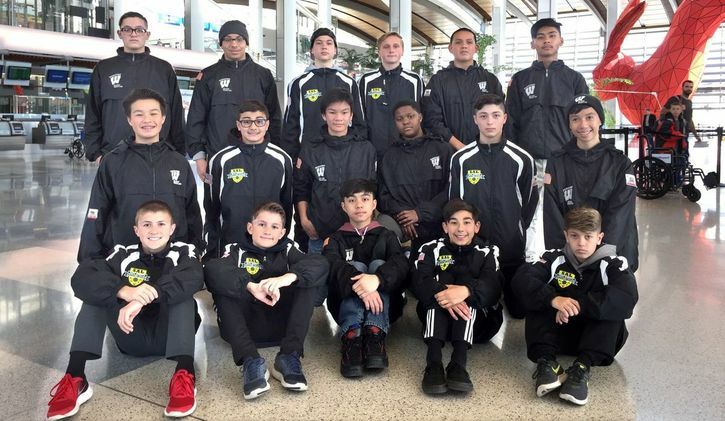 9 of 11 boys weight classes went the way of the Academy as Christian Delacruz, Jacob Meneses, Jahon WIlliams, Daniel Alencastro and Jeremy Richardson of our Illinois Travel squad set the tone. Also scoring 1st were 7th graders Alexander Bonifacio and Rafael Ely and 6th graders Davion Castro and DJ Avelino. 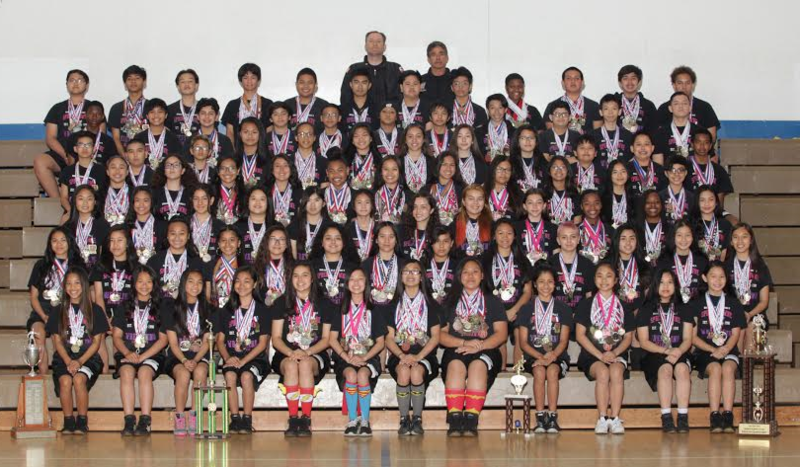 In the girls division the Lady Wildcats took home 18 of the 19 contested weight divisions with 8th graders Tram Tran, Trinh Tran, Sarah Dilag, Rheanna Cantor, Gardenia Martinez, Kimberly Orozco, Gabby Lozano, Valeria Flores, Millicent Bassi, Amilliana Espinosa, Scarlett Sarantes, Neylan Green and Isabella Mendoza placing 1st in the last meet of their career. 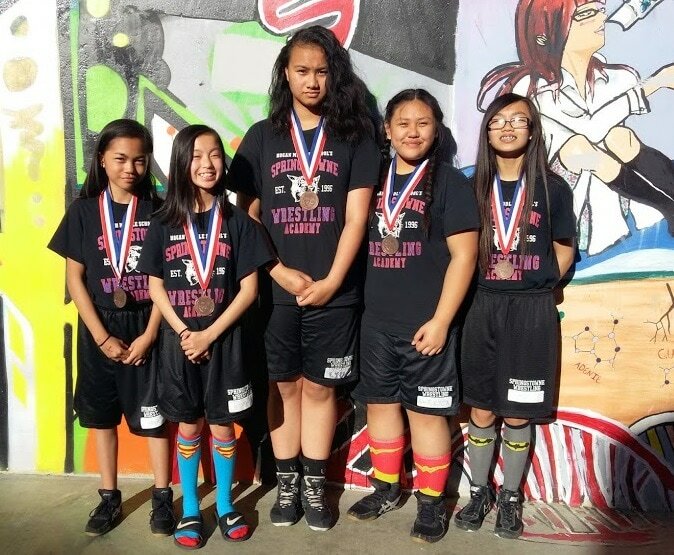 7th graders Eryka Ferrer, Leyana Sunga, Lyric Aguigui, Natalie Smith and Samantha Liu also got in on the action bringing home 1st place in their weight classes. 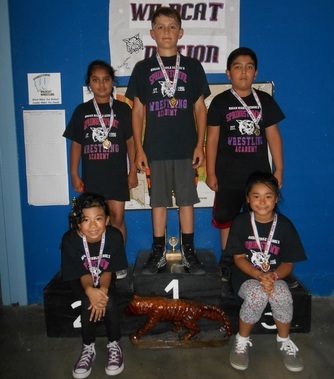 With Steffan Manor Elementary School on hand to watch and varsity spots on the line the following Wildcats pictured took home "Golden Paws" from the Academy Wrestling Championships on April 28th. 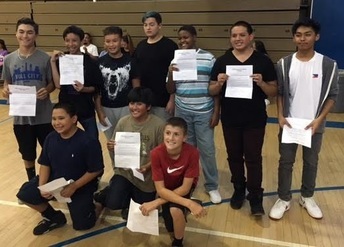 Wildcat Boy Champions: Nicolai De los Reyes, Davion Castro, Alexander Bonifacio, Rafael Ely, Robert Couvson, Kyle Lagmay, Julian Meneses, Jacob Meneses, Cesar Delgado, DJ Avelino, David Tabora, Dustin Dizon, Jahon Williams and Jeremy Richardson. 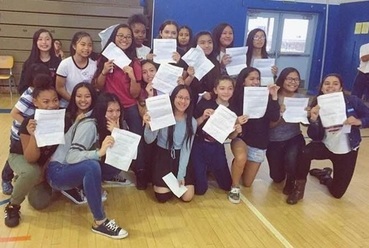 Lady Wildcat Champions: Tram Tran, Trinh Tran, Eryka Ferrer, Gardenia Martinez, Kimberly Orozco, Gabby Lozano, Leyana Sunga, Angelene Lacsa, Amoorea Percy, Lyric Aguigui, Neylan Green, Victoria Ellender, Natalie Smith, Isabella Mendoza and Denise Feria. The 3rd Annual Spring Challenge was kicked off with the unveiling of our new "Wildcat Nation" banner which was donated by Academy parent Jessica Galvan. 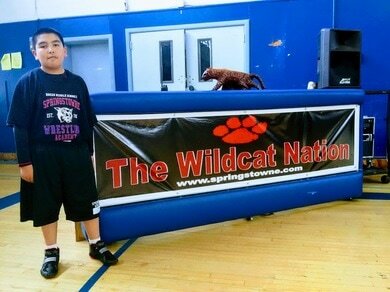 Our Wildcats wrestled inspired with Venetia Valley Middle School of San Rafael coming to our event for the 1st time. A handful of our boys notched 1st round pins. The group included Jacob Meneses, Daniel Alencastro, Alexander Bonifacio, Rafael Ely, Cesar Delgado, Robert Couvson, Jacob Louie and DJ Avelino. Our Lady Wildcats also tallied a plethora of pins with Tram Tran, Trinh Tran, Sokunthery Em, Alexandra Arroyo and Amilliana Espinosa managing 1st round pins! 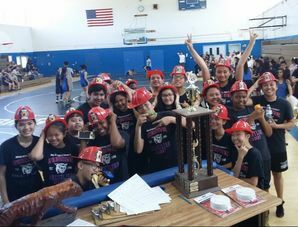 The Springstowne Wildcat Wrestling Academy capped a big weekend of wrestling on Sunday April 2, 2017 by winning both the USGWA and USBWA Middle School Championships at the 20th Annual National Championships at Bethel High School In Vallejo. Leading the Lady Wildcats to the victory was Kimberly Orozco, who nabbed the 107 pound Championship, while Daniel Alencastro Hernandez, Jeremy Richardson and Niel B. Guanlao scored National titles in the 185, 205, and 128 pound weight classes to help the Wildcats grab the USBWA National Champion banner! 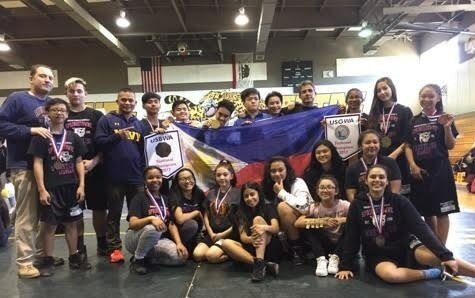 Also faring well were three wrestlers from Safehouse Wrestling of Manila who spent the week with the Springstowne program as part of their international exchange program from the Philippines. 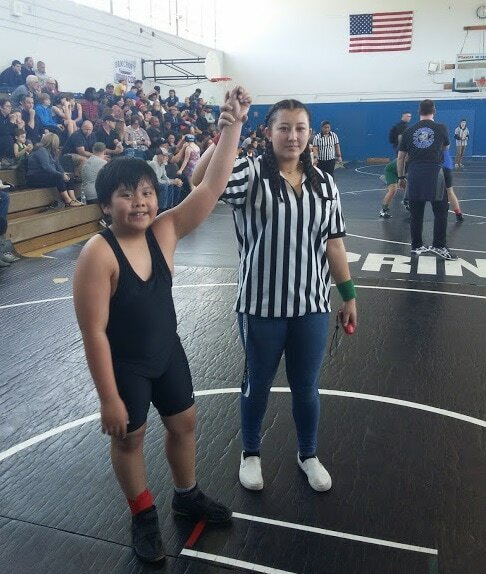 Allen Arcilla placed 1st at 107 in the Middle School Class while his brother Anthony Arcilla(126) scored a bronze and teammate Royce Tiu(185) earned a 4th place medal in the High School Division. 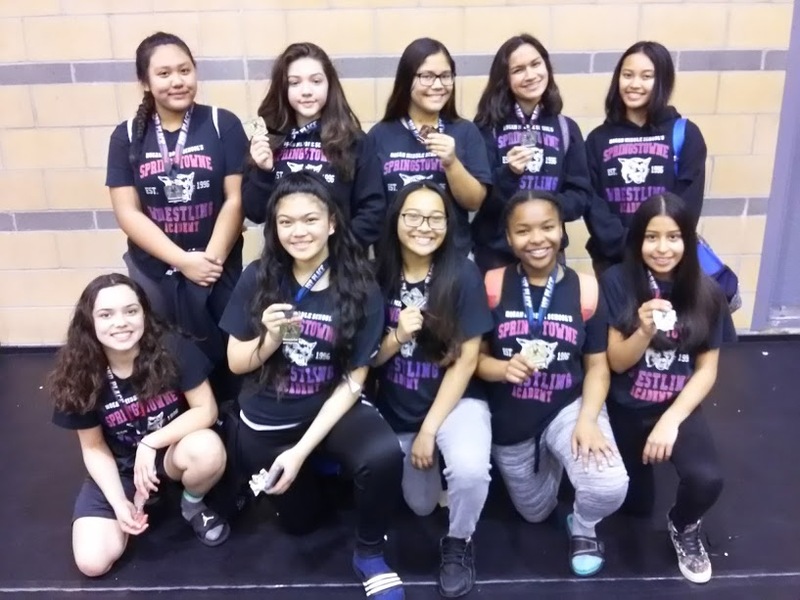 ​On April 1, 2017 the Lady Wildcats finished 9th out of 60 teams at the 13th Annual California Girls Middle School State Championships which were also held at Bethel High School in Vallejo on the front end of the two-day wrestling extravaganza. 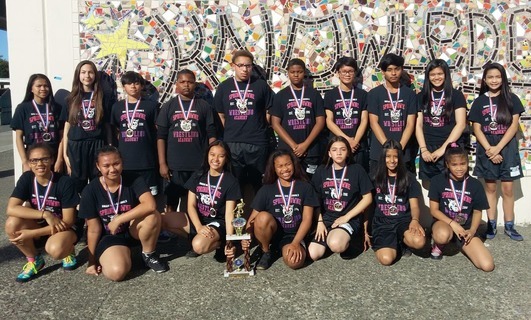 Tram Tran(4th), Samantha Liu(4th), Denise Feria(5th), Jen Pobre(5th), Trinh Tran(6th) and Neylan Green(6th) scored medals to help the Lady Wildcats crack the top ten teams! 17 Springstowne Academy and Napa SAL wrestlers have come together to represent California at the USA Wrestling Middle School National Duals in Illinois. 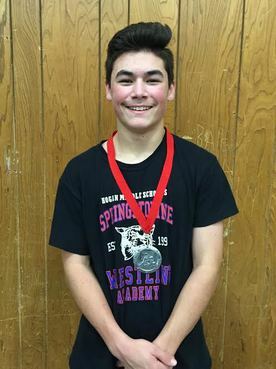 ​Springstowne Academy Wrestler Medals At T.O.C. 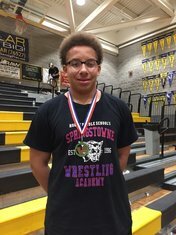 Jeremy Richardson, an 8th grader for the Springstowne Wildcat Wrestling Academy, scored a 6th place medal at the 49th Annual Northern California Tournament of Champions. Richardson,who joined the program in the fall after learning the sport in his p.e. class, notched pin falls over wrestlers from Reedley, Roseville and Auburn. He became the 6th Springstowe Wildcat Wrestler to place at the prestigious event which draws over 500 wrestlers from the Oregon Border to the North and to Tehachapi in the south! ​Forty-Seven Springstowne Lady Wildcat Wrestlers scored medals at the 18th Annual United States Girls Wrestling Association Northern California Championships. 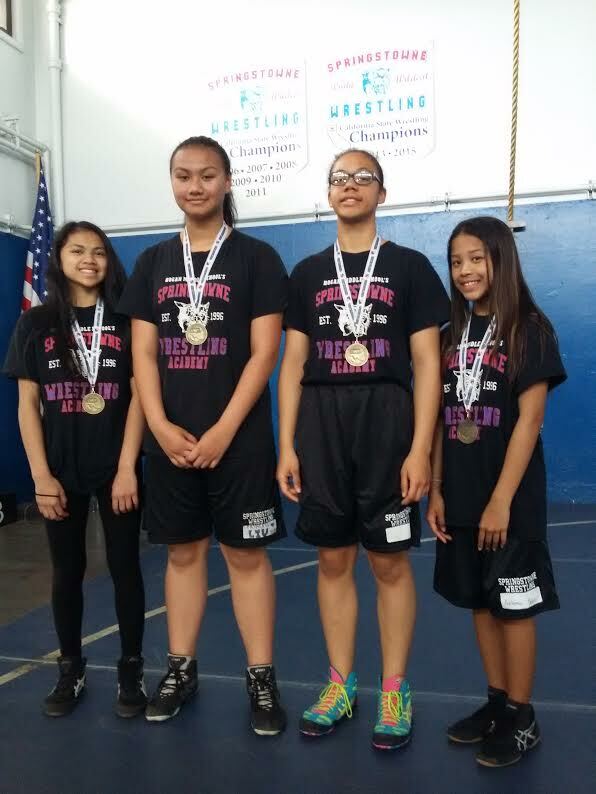 Leading the way were Eryka Ferrer, Samantha Liu, Natalie Smith and Norianne Meim who won Gold Medals in their individual weight classes. This marked the 13th year the USGWA has hosted the event in Vallejo. Our Vietnamese-American Wildcats beam with pride following our efforts at the HVT Classic! Squaring off vs Bancroft-San Leandro and the Napa SAL, our Springstowne Wildcat Wrestlers fared well at the 8th Annual Hoang Van Thu Classic. 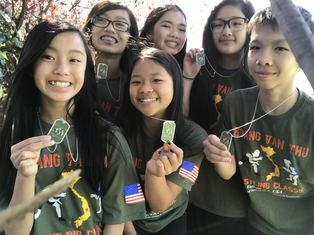 The event is wrestled in memory of Coach Guiducci's father James P. Guiducci, who served two-voluntary tours in Vietnam, and raises money to support education at Hoang Van Thu School in Viet Nam. ​We raised $365 to support Hoang Van Thu at the event! ​On February 12, 2017 our Wildcats took to the mats vs wrestlers from San Leandro, Napa and St. Helena in our annual scrimmage. 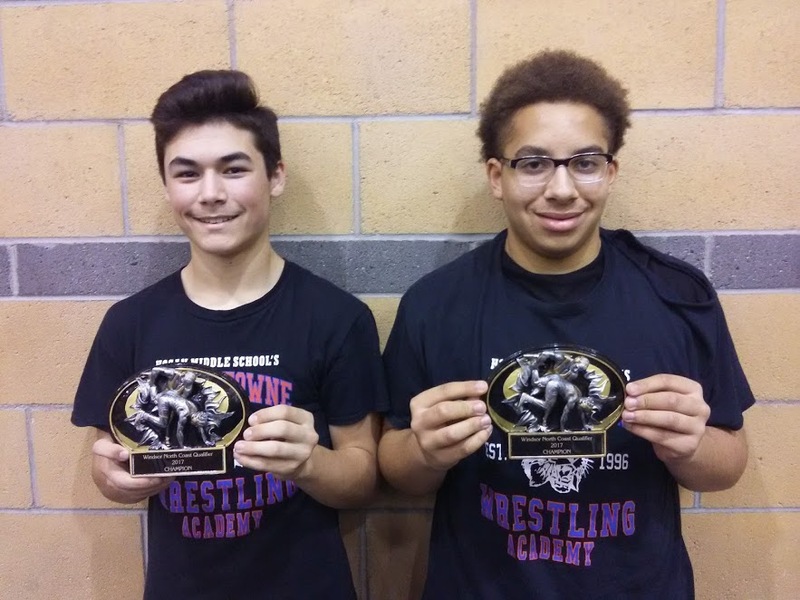 A handful of Academy wrestlers notched 2-0 records on the day including Neylan Green, Scarlett Sarantes, Kainoa Hernandez, Alex Bonifacio and Davion Castro. Also picking up impressive wins were twins Zophia and Jazmine Santiago. Two Wildcat boys took home North Coast Championship T.O.C. qualifier while nine Lady Wildcats medalled in the girls class in Windsor on February 4th. Stefan Foley Jr. and Jeremy Richardson both placed 1st, while Keith Sims(2nd) and Jahon Williams(3rd) also medalled. 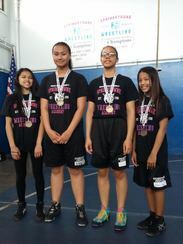 Leading the way for the Lady Wildcats were Amoorea Percy, Valeria Flores and Isabella Mendoza who brought home gold medals. 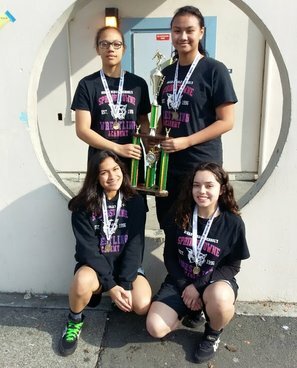 Gardenia Martinez(2nd), Gabby Lozano(2nd), Amilliana Espinosa(2nd), Denise Feria(2nd), Angelene Lacsa(3rd) and Victoria Ellender(3rd) rounded out the medal count. 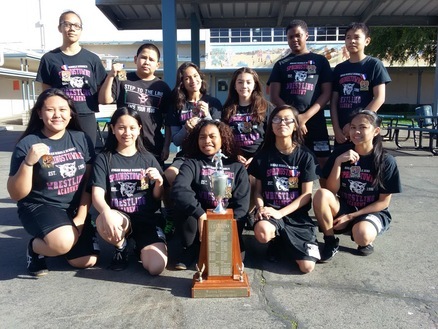 The Lady Wildcats won their 9th consecutive Solano County Girls Wrestling Championship scoring 98 points to best Benicia(60), Davis(33), Vaca Pena(22), Napa SAL(20), Jepson(10) and the Vallejo PAL(10). 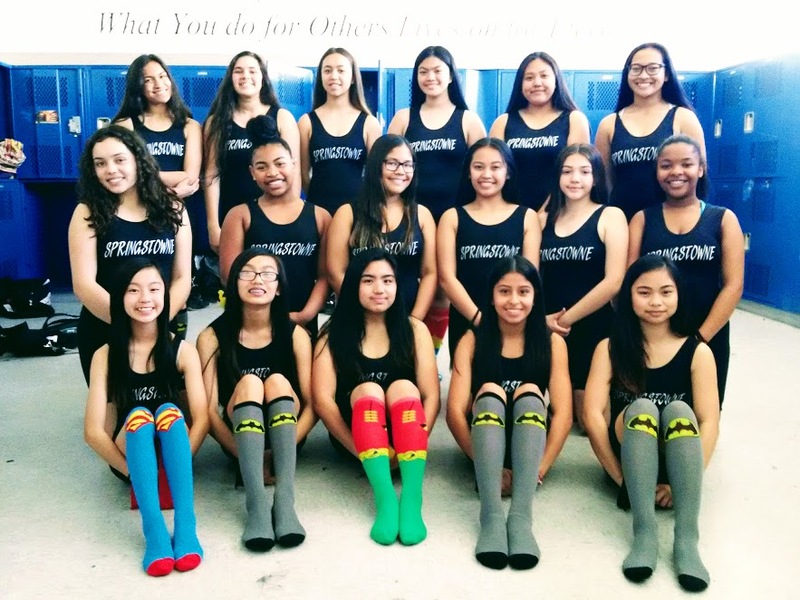 Gabby Lozano, Amilliana Espinosa, Natalie Smith and Samantha Liu scored individual Solano County titles to pace Springstowne Academy to victory. Stefan Foley Jr. represented at the Solano County Clash scoring a Silver Medal to qualify for the 49th Annual Northern California Tournament of Champions. 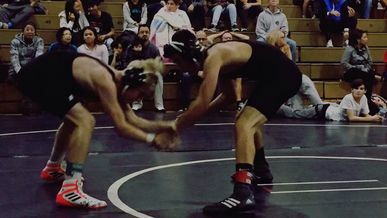 He picked up victories vs Jepson, Benicia and C.A. Jacobs before falling in the finals. This will be his 2nd trip to T.O.C. in as many years! Our Illinois Travel Squad which will feature a combination of our Academy Wrestlers and a half dozen Napa SAL wrestlers came together to take on the vaunted Jepson Jaguars of Vacaville. After an early see-saw battle in the lower to middle weights Jepson eventually pulled away for a 60-28 win. 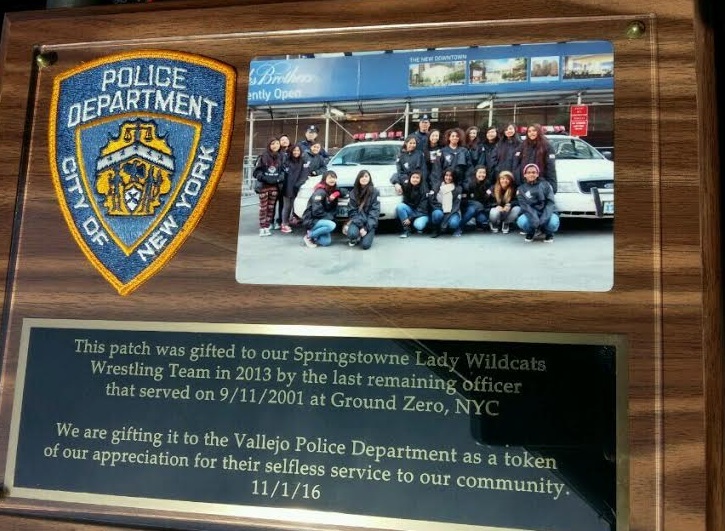 Picking up wins for the Springtowne-Napa Sheriffs were Wildcats Stefan Foley Jr. and Keith Sims and Sheriffs Cooper Cohee, Nick Trave, Jacob Guiducci and Dylan Smith. After a decade and a half of competing as friendly rivals this was the 1st time our two programs competed together which served as preparation for the USA Middle School National Duals in March. 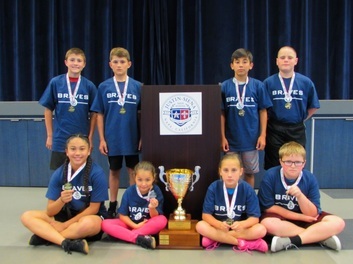 The Springstowne Wrestling Academy scored 176 points to best the Napa SAL's 105 points to capture the Winter League Championship. Leading the Wildcat charge were Gold Medal winners Daniel Solar, Thomas Manibusan, Jahon Williams, Jeremy Richardson, Trinh Tran, Eryka Ferrer, Sokuntheary Em, Gabby Lozano, Valeria Flores, Neylan Green, Natalie Smith and Denise Feria. 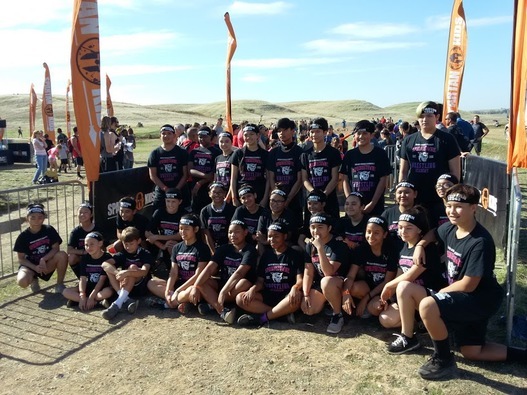 28 wrestlers gave it their all at the Spartan Race in Sacramento on November 13, 2016. ​New Mexico and Illinois this Spring!!! ​Sir William Fisher, Jeremy Richardson, Jahon Williams, Christian Delacruz, Jacob Meneses, Isabella Mendoza and Jan Marcy Soy. (Bottom L to R) Natalie Smith, Samantha Liu, Millicen Bassi, Neylan Green, Valeria Flores, Gardenia Martinez Alonso and Daisy Mae Huerta. The Vallejo Police Department was on hand to greet our Academy Wrestlers as they entered the building for our Kickoff Scrimmage. 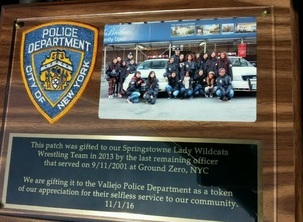 Prior to the scrimmage Officer Brenton Garrick was presented a plaque from our program that included a NYPD patch that was gifted to our Lady Wildcats at Ground Zero, NYC. Following the presentation our Wildcats took to the mats to put on a show for our guests. Fourteen Wildcat Wrestling Academy Alumni volunteered their time to give back to 49 current wrestlers and 11 Future Wildcats. As clinicians they taught an array of skills to our kids and oversaw our 12th Annual Mini-Takedown tournament. 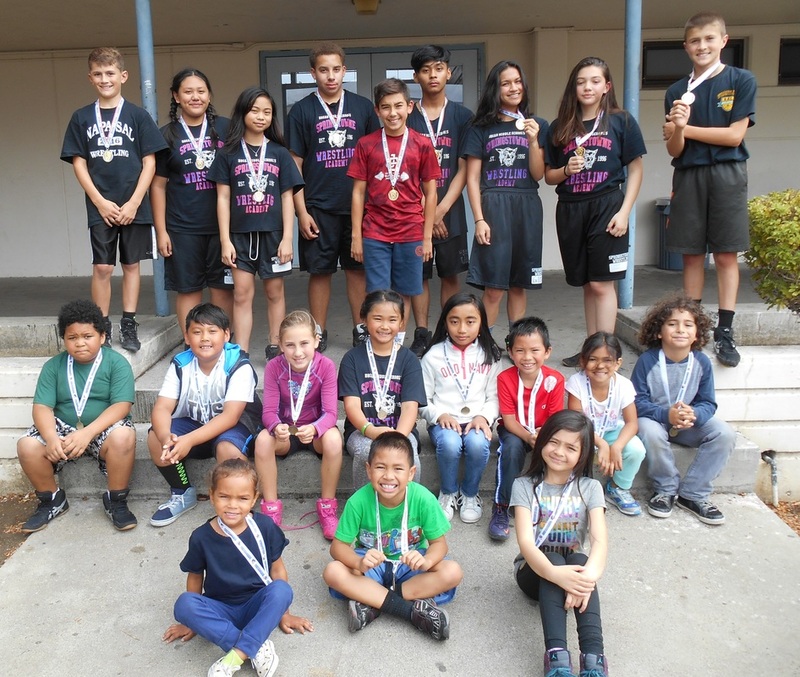 Scoring medals in the middle school division were Sarah Dilag, Gabby Lozano, Valeria Flores, Denise Feria, Nick Trave, Brandon Guiducci, Jacob Guiducci, Jacob Meneses and Jeremy Richardson. 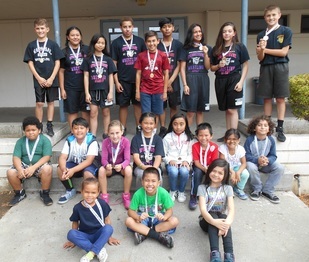 Medals were also given to the elementary participants in the "Future Wildcats" Division. 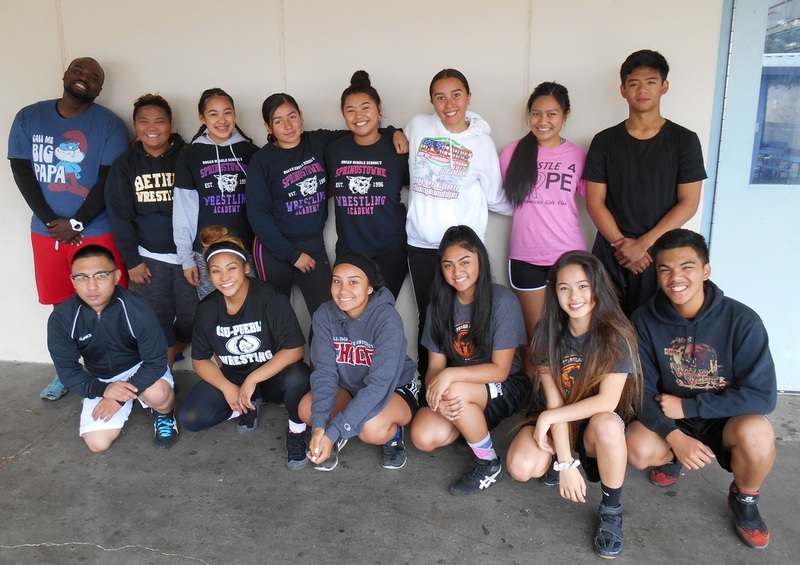 Special thanks to Alumni Clinicians Michael Lim '05, Shelly Avelino '13, Stephanie Cajina '13, Meriel Ferrer '16, Trinity~Jade Castillo-Holloway '16, Nathan Huerta '14, Dimitrius Berry '05, Amanda Avelino '09, Chentelle Wise '15, Leslie Uribe '15, Caesha Gemo '15, Ashley Cajina '15, Marjorie Soy '14 and Anthony Bonifacio '16. 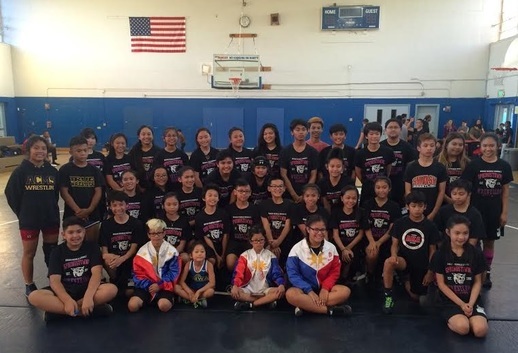 For the 6th consecutive season our program hosted to Philippines Wrestling Showcase. Scores of Wildcat wrestlers took to the mats joining competitors from American Canyon, Pleasanton, Sacramento and San Jose. At what was one of our biggest kickoff potlucks in program history our Lady Wildcat Veterans learned they would be traveling to New Mexico for the Wrestle4Hope All-American Girls Classic, while our boys discovered they will be teaming with the Napa SAL to compete in the Middle School National Duals in Illinois. Thank you for all the family and alumni support. It's gonna be a great year!!! 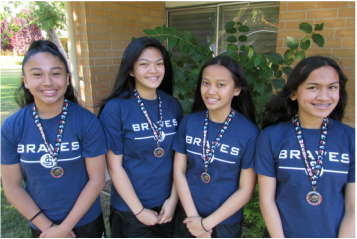 Lady Wildcats Lyric Aguigui, Isabella Mendoza, Millicent Bassi and Gabby Lozano earned All-Camp Team Medals at the Justin-Siena Braves Summer Wreslting Camp's July Session. 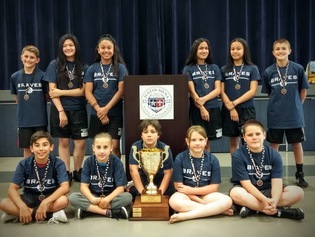 The Future Wildcats Wrestling For Fun Summer Camp which is designed to inspire K-5 wrestlers through fun and challenging activities did just that. Heena Bharti and Brandon Guiducci completed their 3rd camp, while Mateo Tafoya, Yvonne Calimbas and Renee Meneses did a fine job in their 1st time at the camp. 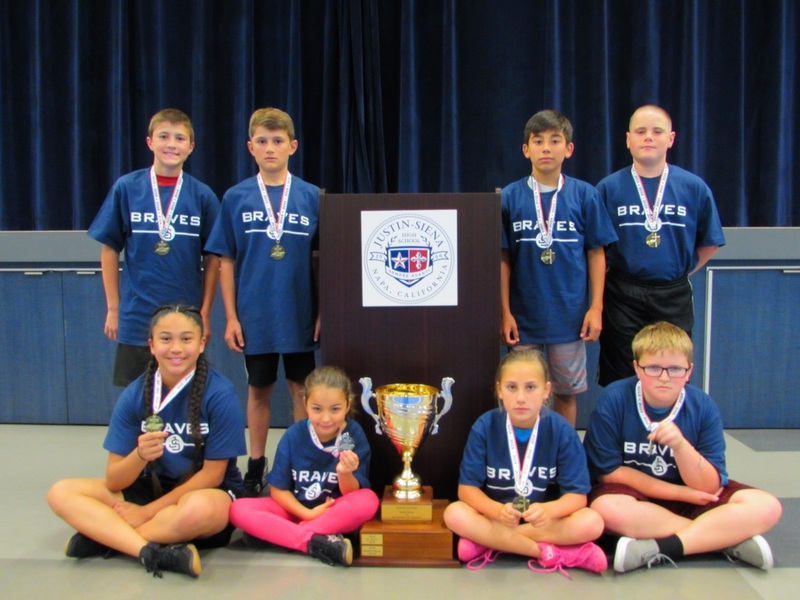 Lyric Aguigui recently finished her sixth-grade year competing for the Springstowne Wildcat Wrestling Academy and was named to the All-Camp Team at the Justin-Siena Braves Summer Wrestling Camp’s June Session. Aguigui had a solid season, placing first in both the Vallejo City Championships and Solano County Championships. 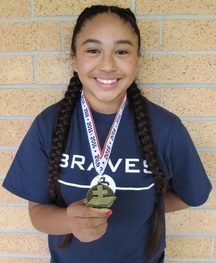 She attended the camp, which drew wrestlers from Napa, American Canyon, Petaluma and Vallejo. The All-Camp team photo is shown. Aguigui is seated on the bottom row at left in the team photo.